As I say, all dogs are community projects; no-one can ask for that work to be locked or deleted without agreement from the other contributors. Not maintained by me anymore. Thank you very much for your support Kazza. Thank you very much for your support Smokey. All DebianDog and MintPup files are uploaded at github. Links available in the first page post. Click here for bugs and fixes information. My thanks to Daniel Baumann! DebianDog wouldn't exist without his work. Edit: 04.09.2015 - New iso images uploaded. List of changes read here. DebianDog project started as Light-Wheezy+Porteus-Wheezy. It is not Puppy linux and it has nothing to do with Puppy based on Debian. Downloading DebianDog be ready to learn different package manager and different system setup in Debian manner. Both systemd and sysvinit included with choice to boot the init you prefer. If you need to edit the boot code keep in mind adding init=/bin/systemd will boot with systemd. Removing init=/bin/systemd will boot with sysvinit. DebianDog is very small Debian Wheezy Live CD shaped to look like Puppy and act like Puppy. Debian structure and Debian behaviour are untouched and Debian documentation is 100% valid for DebianDog. You have access to all debian repositories using apt-get or synaptic. To test DebianDog for first time you need to burn it on CD and boot from it, or use DebianDog-installer (included in the iso and working from most linux systems) to make frugal install to HDD or USB, or to extract /live folder on top of a partition or USB and edit grub menu.lst. DebianDog is set to autologin as root. If you like to use it as multiuser system it is recommended to start XDM login manager (available only in Jwm version). Just type in terminal xdm-start and reboot. xdm-stop will reverse back autologin as root. In OpenBox version you can install this slim deb package and use menu System -> Start/Stop Slim display-manager. If you like to change the default autologin as root to autologin as user read here how to do it. Check for updated iso images here first. 1. DebianDog-Wheezy-jwm_icewm-2015-09-02.iso - 119 Mb (kernel 3.2.0-4-486 for older PC). DebianDog-Wheezy-jwm_icewm-2015-09-02-PAE.iso -141 Mb (kernel 3.16.0-4-686-pae for modern multi-core PC. You can try adding forcepae boot parameter to boot this iso on PC without SMP support). Default WM - JWM with option to switch to IceWM. Default File Manager - XFE with option to use Rox. Default Internet Browser - Dillo. 2. DebianDog-Wheezy-openbox_xfce-2015-09-02.iso - 159 Mb (from Fred) - (kernel 3.2.0.4-486 for older PC). DebianDog-Wheezy-openbox_xfce-2015-09-02-PAE.iso - 180 Mb (from Fred) - (kernel 3.16.0-4-686-pae for modern multi-core PC. You can try adding forcepae boot parameter to boot this iso on PC without SMP support). Default WM - OpenBox with XFCE. Default File Manager - Thunar with option to use Rox or XFE. DebianDog-Wheezy is avalable with kernel 3.2.0-4-486 (for older machines) and kernel 3.16.0-4-686-pae (for modern multi-core machines). In case you like to experiment with other kernel read here how to boot easy with different kernel module. We have 3 different initrd files included which gives 3 different boot and save file options. I will explain them proper in the next post. Please, read also Examples-boot-codes for boot options. After testing the boot methods and save file options and decide which one is best for you, just remove 2 initrd files to save 15 Mb system space. Both versions have a lot in common as boot and save file options. The difference is in the WM and applications choice. To keep the size small as possible all /usr/share/locale files for the included packages are moved in separate squashfs module (00-locale-files-openbox_xfce.squashfs and 00-locale-files-jwm-icewm.squashfs ) available for download from here or here. Included menu-openbox from Fred with localisation support (the default menu displays categories and menu entries only in English). In case you like to change the localisation type menu-openbox in terminal or start it from System -> Menu Openbox. More information about changing localization read here, here and here. In post five on this page you will find information how to install packages in Debian with Synaptic (GUI) or apt-get (CLI). DebianDog has tools similar to Puppy. You can create easy separate squashfs modules and remaster the system with all personal changes. You can even use/convert pet packages and sfs files from Puppy but it is not recommended if you like to keep well working apt-get/Synaptic package manager (which is the main advantage using DebianDog). And to Sickgut for his original idea that made possible DebianDog to exist. DebianDog-SID-Test.iso (Unstable Debian) version - testing. Edit: 02.02.2015 - Both DebianDog iso replaced with new versions. List of changes read here. Edit: 14.10.2014 - Both DebianDog iso replaced with new versions. List of changes read here. Edit: 11.08.2014: New version Porteus-Wheezy-3.13.6-openbox.iso with systemd boot enabled, kernel 3.13.6 from Porteus and modules extension changed to .xzm (like in Porteus). Mirror link + old versions. Edit: 23.07.2014 - DebianDog changed to stable version. List of changes you can find here. Never use the same /live folder name for more DebianDog frugall install on different partitions. Use different folder name for more DebianDog frugal install. You will find information and example boot codes in the links below for each boot method. 1. 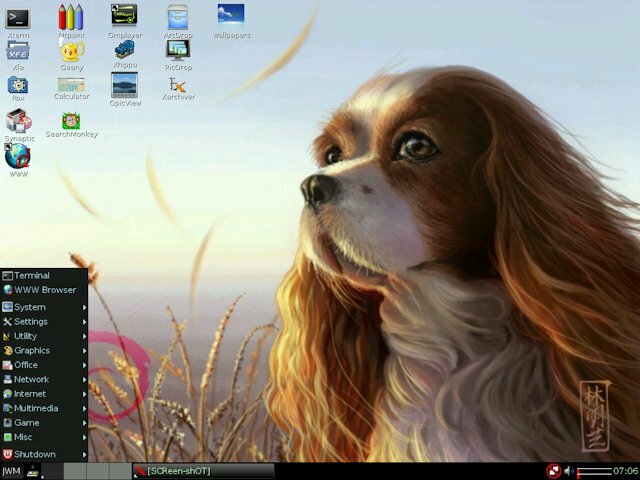 Debian-Dog porteus-boot - porteus initrd1.xz made for debian kernel and firmware. Chose this one if you are familiar with Porteus or Puppy linux. Available option for encrypted save file. 2. DebianDog live-boot-2 - debian initrd1.img created with initramfs-tools-v2.x. Chose this one if you are familiar with Debian-Squeeze save file options. 3. DebianDog live-boot-3- debian initrd.img created with initramfs-tools-v3.x. Chose this one if you are familiar with Debian-Wheezy save file options. Available option for encrypted save file or encrypted save partition. Make your boot choice and you can delete 2 initrd files to save 15 Mb space from the system size. 06-DEVX-DebDog-2.squashfs - DEVX compiling programs module for DebianDog. It is easy to apt-get all needed but we have separate module for faster use. 061-man-doc-info.squashfs - all man, info and doc files in DebianDog are zero-sized to save space. This module has all man, info and doc files. Load it with SFS loader or place it in /live and reboot. 00-locale-files-jwm-icewm.squashfs - DebianDog has only english localization. If you like to use other localization load this module. It has all /usr/share/locale files for all installed in DebianDog-jwm-icewm programs. To save space you can simply copy/paste only the language files you need. Otherwise the module adds 22Mb to the system size. 00-locale-files-openbox_xfce.squashfs - all /usr/share/locale files for all installed in DebianDog-openbox-xfce programs. 031-firmware-porteus.squashfs - Firmware from Porteus. Use it in case some device does not work. It might fix the problem. 062-AptOnCD.squashfs - create portable CD/DVD repository with debian packages of your choice. Read more. SoftMaker-FreeOffice-2012.squashfs - You need free registration to use it. Also debian package available for download. 064-cups.squashfs - if you use printing seldom and prefer not to install it. ffmpeg-static-0.9.4.squashfs - Read more here. 08-googleearth-debdog.squashfs - testing reports about this module welcome. spotify-0.6.4-wine-portable.squashfs - more information here. 024-goffice-lupu-528JP-1.squashfs - 5,4Mb - Abiword-2.8.6, Gnumeric-1.10.13, Inkscapelite, ssconvert, ssgrep, ssindex. Converted from Lupu module. Compatible with DebianDog-Wheezy and Squeeze versions. Special utilities added in DebianDog - (not available from Debian repository) and first boot settings programs. DebianDog-Install - installer for frugall/full USB/HDD using grub4dos/syslinux with option to install from iso or directory. Desktop Editor - edit /usr/share/applications/*.desktop files. Menu-Debian - will reverse back the standard Debian menu generated from /usr/share/menu files but with less submenus setup. RemasterCow - create separate squashfs (SFS) module with system last session changes only. RemasterDog - remaster DebianDog with all your changes in new main file system module. Audio-setup - run it only if you do not have sound on boot. Frisbee - run it only if you do not have working internet connection on boot. Added menu entry to replace Frisbee with Simple_Network_Setup from local deb package without need of working internet connection. ffmpeg2sfs - script to create small ffmpeg.sfs instead installing. Keyboard layout - add different keyboard layout. Set Time Zone - run it to setup your time zone. It will setup date and time automatic. Set Default Apps - changing the links for default programs. Ram Profile High and Ram Profile Low - stops/starts wallpapers, desktop drive icons and taskbar icons for frisbee and volume-icon. Saves around 8-10 Mb RAM for very limited Ram machines. Wallpapers - change and setup different wallpapers for each desktop. apt2sfs - create sfs module from apt-get downloaded programs without installing them. Make Save File - create save (encrypted save) file for any boot method (live-rw, persistence, changes.dat). SFS-Loader-new, SFS-Loader-old - load SFS (squashfs) modules. There is also right click load/unload option for Rox, XFE, Thunar. SFS-Portable - create executable script to run (load/unload) SFS module as NoInstallApp. ScreenShot - scrot-dlg screenshot program. Xhippo and Xrecord - audio/video player and sound recorder. Picdrop desktop icon - drag and drop resize pictures utility. ArcDrop desktop icon - drag and drop archive/extract utility. AutoMount-Start/Stop menu entries - start and stop auto-mount all drives on boot. Resize-Save-File - resize save file script. Rcconfog-Xdialog - startup services manager frontend for rcconf. Make new initrd files GUI - aoto-create initramfs for each boot method in case different kerenel is installed. pet2sfs and pet2deb - Convert pet packages scripts with right click option in Rox, Xfe, Thunar. Live-snapshot and make snapshot - save in gz compressed file option for live-boot-2x. In case the deb package is not compatible with Debian-Wheezy (DebianDog) you will be prompt to remove the installed package since the dependencies can not be solved. It can happen for example with older Debian Versions packages like Squeeze or Lenny. If you have an older machine (ten year old or so) and are having trouble to get DebianDog to boot from grub4dos when the debiandog live folder is on usb, as a last resort you can try the following method of formatting a usb to ext4 first. If I instead use Gparted to format my usb stick, and install debiandog onto that, I find that the result boots fine on my newer computer, but can't find files on my older one. 2. The above reduces the apparent heads to 16 (-H 16) (which presumably works around a BIOS limitations problem on my old machine) and formats /dev/sdb1 partition with ext4 fs. Then I simply run debdog-install, click on /dev/sdb1 partition, select debiandog install iso (or my /mnt/home/live folder), and press the install button (I avoid using gparted since that seems to muck up the heads bit; not that there is anything wrong with gparted - it is probably just using the kernel's representation of CHS values, which is fine for most modern computers). The result boots on both my old and newer computer and the bootable (*) /dev/sdb1 Linux (L) partition starts on 8MiB boundary (16384 sectors). Any plans (for us traditionalists) to give this a full install option ? BTW gave this a run yesterday , very good job ! I think with some help it will be possible to give full install option. I will do some testing how it can be done proper with Debian. In the meantime you can have something very close to full install but only with live-boot-v.2.x and live-boot-v.3.x It will not work with porteus-boot. Make frugal install on sda1 (for example). Create sda2 ext partition and label the partition live-rw (for live-boot-v.2.x) or persistence (for live-boot-v.3.x it will also need persistence.conf file inside). Extract the content of /live/01-filesystem.squashfs on top of sda2 partition. Then create new empty 01-filesystem.squashfs from empty folder (/live/empty for example). Reboot the computer with the same code for frugal install. Now you boot DebianDog with empty squashfs module and all files are inside sda2 save partition uncompressed in RW mode. The difference from full install is you still have initrd file in use. Toni saintless wow thanks for providing this Dog. instructions so I look at it later when many have tested it. DebianDog has kernel 3.2.0-4-486. If it works for your hardware you need nothing more. If it doesn't, please, read the third post how to boot easy with different kernel. When you decide to test it just write here. We will help. BTW with porteus-boot method you will be able to save changes in save file on NTFS partition. # Congratulations # DebianDog has been a rather long time in it`s coming. DebianDog is Debian-Live. Ubuntu and others are based on Debian. DebianDog is the Linux O.S. that I have been talking about for so long. It`s greatest strength is having the enormous Debian repository of applications. It still needs polishing like Puppy has been polished for almost 10 years now. # I`m so very glad I was able to put in my 2 cents worth and help a little bit. Thanks, I will consider it. and this OS make use of maybe same code. in case copy-right was the issue with porteus? Even if this is true DebianDog does not have a problem. All we have from Porteus is included in initrd1.xz file for porteus boot. In the worst case we will remove porteus initrd1.xz file and DebianDog will boot only pure Debian methods. We can even try to modify Puppy boot method to replace porteus one if it is needed. I'm sure soon we will know what is the problem with Porteus site. Looks like some people goes bit paranoid about porteus.org being still down. So to make things clear and answer some questions: No - we did not get hacked and No Porteus is not 'dead' We are still alive and kicking. We cant put the site up till the announcement i want to post is approved by all Team members. OTOH - nice to see that you do care about us Thanks. Hi guys. As some of you probably noticed porteus.org is down as we are struggling with bandwidth related problem and some other things. Will post announcement and explain everything once it's up and running again. Apologize for the troubles and thanks for your patience. Seems to be a temporary problem. .. if you just use the standard iso it will work in most cases, as Toni stated in first post. Yes, it did, and thanks a lot! I'm back in Lucid Puppy now, because I don't know how to find and install Debian software; are they called "packages". In Puppy, I look for .pet packages of, for example, claws e-mail, or Opera browser. I'm certainly aware that Debian uses apt-get, but am almost totally unfamiliar with how to.